Sip is a water-consumption tracking app, emerged from a personal desire to drink more water, in an effort to improve my health. The users would include all those individuals who would like to increase their water intake, particularly those who live alone. The user would have to be a smartphone-using, technologically-savvy individual. While the app is open and free for everyone to use, younger, independently living individuals are expected to utilize this app most. The user would likely begin with the same desire to increase their water intake, from personal motives, such as health or beauty. Through this app, they would hope to improve and regulate their water consumption. To create an interactive, entertaining yet effective method of keeping track of the user’s water consumption while providing a method of encouraging and improving water intake and overall health. For a first-time user, the app would initiate a profile creation and initial set-up upon first use. 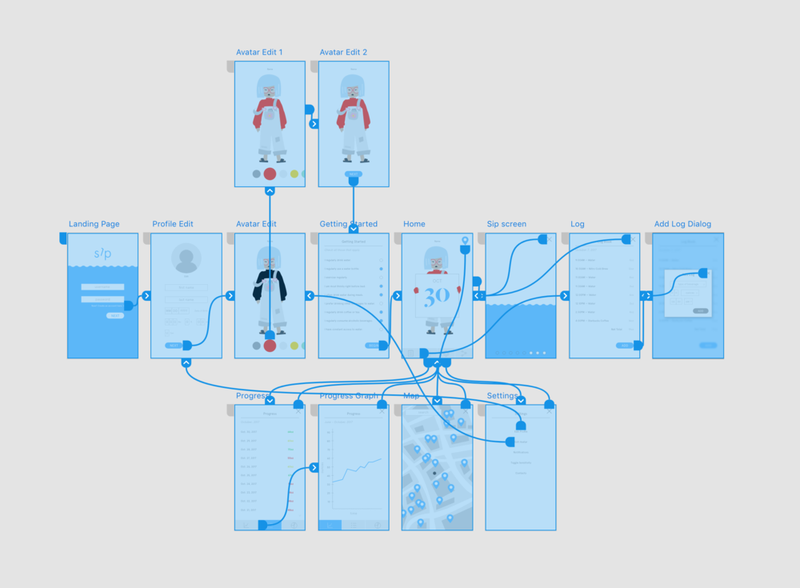 The user would be able to customize their personal profile based on their existing water drinking habits. 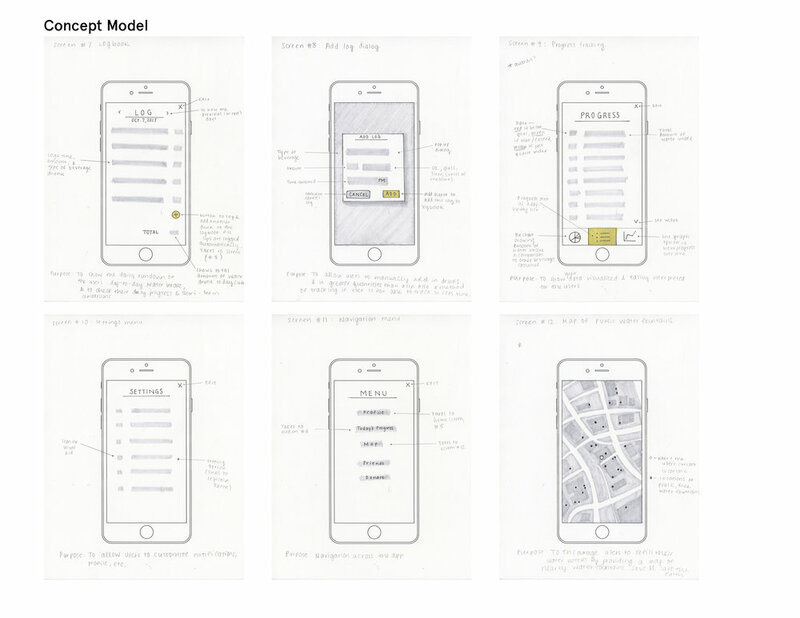 The app would then set a goal for the user as determined by the user’s habits. The user would also be able to create and style an avatar (example above). 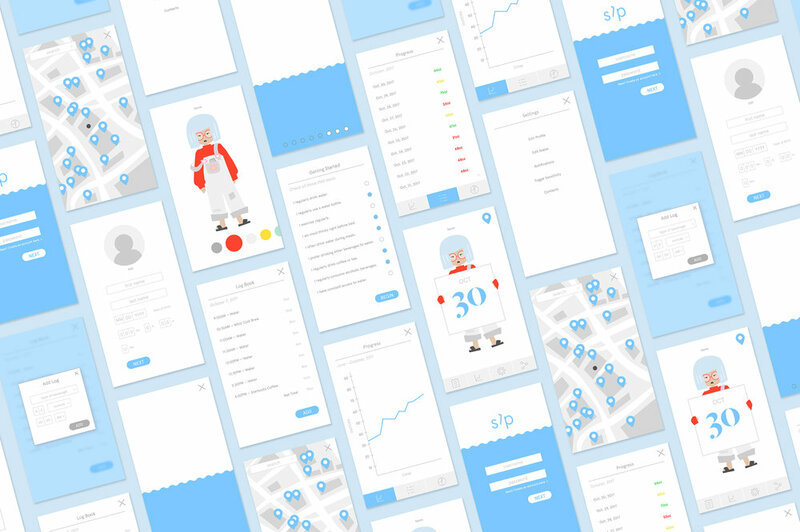 This avatar would represent the user throughout the app, and visually reflect the health of the user as it changes with the amount of water consumed. For both first-time and primary users, the home screen serves as a portal to all the other features of the app. As mentioned before, the expressions and poses of the avatar represent the health level of the user as reflected by the amount of water intake. The app also includes a log book, cataloging the daily water intake of the user. There are two methods of entry: 1) a manual entry into the log book, and 2) each time the user takes a sip of water, be it from a glass or water bottle, so long as they hold their phone in the same hand that they hold the drink, the app’s internal accelerometer will be able to pick up on the quantity and duration of each sip, thereby automatically logging the amount of water consumed. Alternatively, the app can be connected to the user's Apple Watch, allowing the user to log "sips" so long as the drink is held in the same hand that the watch is worn on. The progress feature, on the other hand, tracks the user’s personal data over time through various view options, including a list, graph, or chart. The settings menu allows for notification customization and other edits in the app. At the top of home screen, a location indicator icon leads to a map that indicates the user’s current location, as well as all the nearby water fountains.